Looking for the right employee engagement software solution? Chances are you’ll find yourself in a micro-universe of platforms and tools that promise to change the way you understand, engage with, and motivate your employees. Choosing the right one for your contact center can be a daunting task (there are 247 options on Capterra alone), especially if you don’t know what to look for. And that’s a problem, because, while many platforms offer state-of-the-art metrics and real-time feedback, a lot of the software solutions out there are survey focused. What Are Employee Surveys and Polls? Employee surveys are tools used by organizations to gain feedback on and measure employee engagement, morale, and performance, offering a holistic picture of employees' feelings on working conditions, supervisory impact, and motivation. Most workers don’t like them. Although employee surveys can let employees feel heard, and offer employers insights on where employee morale stands beyond the surface, studies show that many employees distrust employee surveys and polls. Often times, employees either fear that their responses will be shared and aren’t truly confidential, or feel that they take too much time to complete, stealing attention away from valuable work hours. There’s no denying that surveys and polls can provide insights (as limited as they may be) on employee engagement, but they’re far from the best choice when it comes to measuring employee engagement and, more importantly, motivating employees to do better. If you look at Google’s search queries from 2004 to the present, the term “employee engagement” has steadily risen in popularity. That’s because companies increasingly understand the importance of employee engagement on job satisfaction, morale, and success. But, if you look at the terms “employee feedback” and “employee survey” over that same period of time, you’ll notice the number of search queries has steadily decreased. Employee engagement is increasingly being prioritized in the modern workplace, while the former means to measure it—i.e., polls and surveys—is not. In today’s society, there’s more data floating around than most people know what to do with. And when it comes to a company—or contact center—assessing the overall health of an organization, it can be hard to decide which datasets need to be measured. Daily social collaboration and communication, improved employee performance and achievements, and participation (or the initiation of) friendly workplace challenges that test skills and offer bragging rights, are great indicators of overall employee engagement. When tracked alongside KPIs and industry benchmarks, contact center supervisors can get a better overview of their teams and the areas that need improvement. True employee engagement goes far beyond surveys and feedback, which is why nGUVU’s platform collects and crunches over a dozen work performance related data points to find out how engaged an employee is. Our platform measures agent participation in daily activities—including KPIs, contests, challenges, and team interactions, as well as the quality of work—to see where a workplace stands. Not only that, but our nGAGEMENT platform uses gamification, employing a point system that challenges employees to do their best, and tracks their progress through daily achievements and goals to help them boost their KPIs and improve performance. Check out an example of the platform in action below. 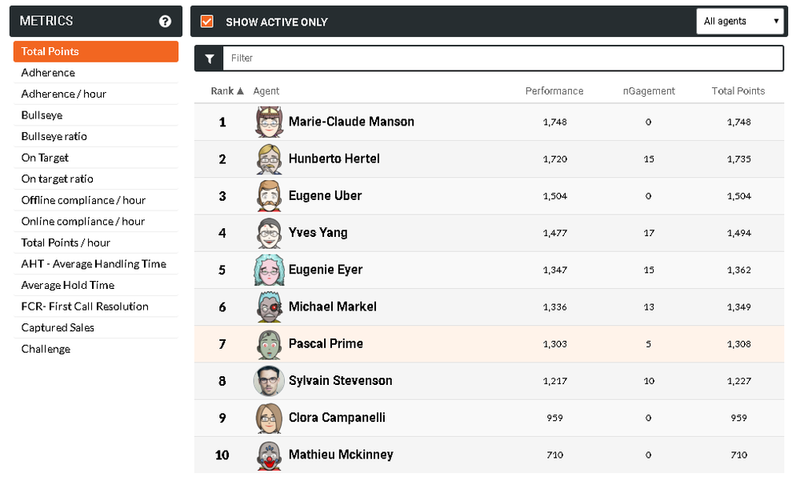 The leaderboard tracks overall performance and nGAGEMENT points, as well as total points, agent-by-agent, to give managers better insights into their teams’ strengths and weaknesses. The metrics are easily defined on the left, while the agents (and their success levels) are listed on the right, giving call center supervisors a birds-eye view of their operations. The best employee engagement solutions out there do more than assign surveys and collect answers. They track data across a variety of parameters to help managers get better visibility into their team’s daily actions, and motivate and inspire their employees to keep them engaged, accountable, happy, and active in the workplace. If you’re looking to improve employee engagement, see if nGUVU is right for you by requesting a demo. Older PostEmployee Engagement Strategies & Software - How Critical Is It In 2018?